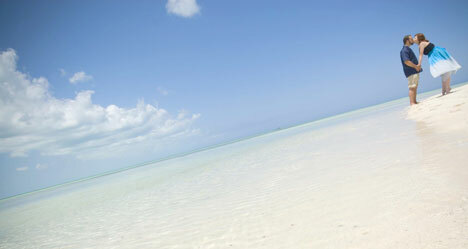 Our wedding at Sol Cayo Guillermo, Cuba, was amazing! We felt really lucky to have over 40 guests with us for an entire week in paradise. The resort was the perfect size. It felt almost as though it was our own personal wedding resort! Everyday seemed to be the best day of our lives, until the next evening when we would assert the same sentiment. We knew as soon as we connected with our travel agent Bonnie Jowsey (Carlson Wagonlit, Cambridge) that she was going to be great! We had already tried with little success to plan the wedding with three other agents, so we knew that we had hit the Jackpot when we met her. Bonnie always got back to us immediately about any concerns we had, was fantastic with our family and friends (who have used her for other travel arrangements since!) and went out of her way to ensure that all of our travel plans went as smoothly as possible. 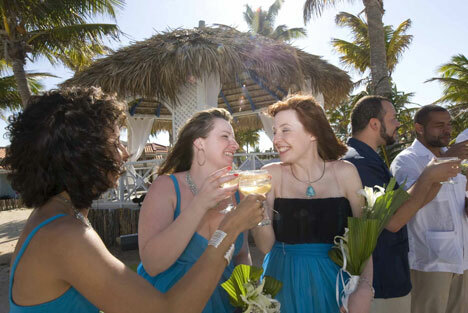 The Sol Cayo Guillermo staff was also very helpful in making our wedding a success. Yudy, the wedding coordinator, was instrumental! She was working with us from the beginning via e-mail and then met us immediately once we arrived in Cuba. She took care of almost everything, including putting together top musicians from the island for a Cuban musical treat on our wedding night. The reception and wedding area were well decorated and fairly secluded from the rest of the resort, i.e. we didn't have any uninvited sun burnt, thong-wearing guests stopping by! The morning of our wedding, our exceptional photographer and friend Chelsea Gray (Blushing Bride Studio, Montreal) hired a Cuban ecologist specializing in the tropical birds of the Cayo Coco region. We headed out in his car and took the most memorable wedding photos with pink flamingos, a random two-piece band we stumbled across on the beach, sand dunes and secluded beaches with white powder sand. Chelsea did an amazing job and our Cuban guide Paulino taught us a lot about the local ecology. 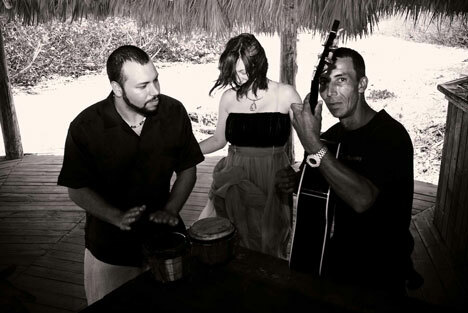 "[the guide] also took us out to a completely desolate hut on a private, unspoiled beach, which turned into an impromptu musical jam with the two security guards! Jean-Simon grabbed the tamtams, one man brought out his guitar, Erin started dancing and when we told them it was their wedding day, they started playing the wedding song! 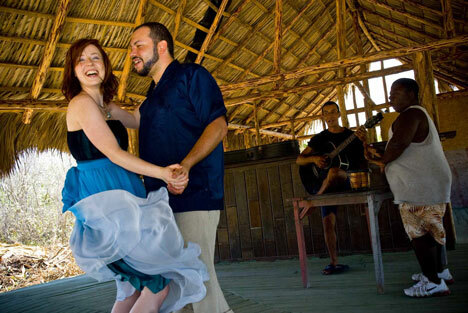 I was so proud to watch Erin and JS dancing together to the Cuban up-tempo version of the "wedding song" in this little remote hut in the middle of nowhere... I can't express how unique that moment was, and it was just the beginning! "..
Before heading to Cuba, our good friend Veronique Drapeau (House of Fashion, Montréal) had designed beautiful wedding dresses for Erin and the bridesmaids to wear on the beach. She produced several sketches from which she worked day and night on the chosen pattern. Veronique accompanied Erin on the hunt to find the perfect fabric and liaised with her bridesmaid?s seamstresses in Montreal, Quebec City and Vancouver. Erin took the dress kit prepared by Veronique to a local seamstress named Penny Dawson (Ottawa), who really delivered under a tight deadline. We wanted to step outside the box and go with a sand-water theme. Erin and her ladies wore stunning turquoise silk dresses and Jean-Simon and his men wore beige linen pants (Island Importer) with white and blue guayabera shirts (Penner?s Inc.). The day of the wedding, Erin and her bridesmaids were very fortunate to have a lifelong friend Lauren Bradshaw (Juice Salon and Esthetics, Vancouver) do their hair and make-up. The loose curls and light make-up went perfectly with the silk dresses for an afternoon beach wedding. 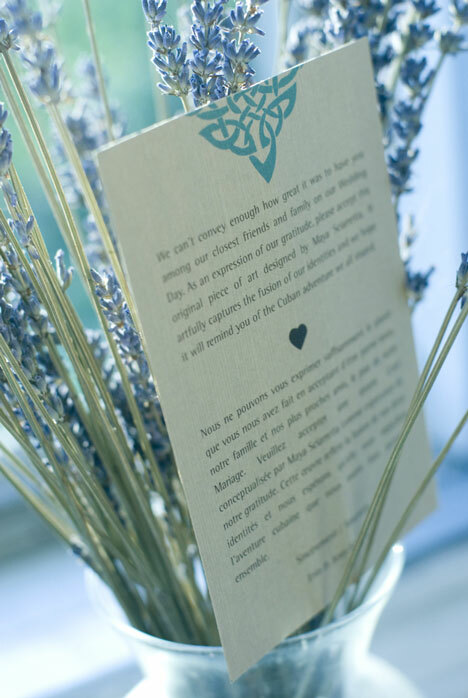 We were also privileged to have had Maya Sciarretta (Volo Studio, Vancouver) design our thank you packages. Together we brainstormed a fantastic idea of creating an original piece of art to offer our guests. Maya combined images that we felt represented the both of us and the result was a unique design symbolizing our lives coming together. She sent us the final pdf design by e-mail and we had them printed at a t-shirt printing company named The Sam Group (Ottawa). 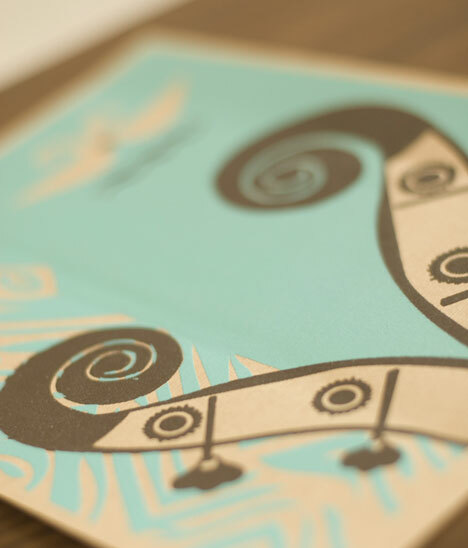 As per Maya's suggestion, the t-shirt printing effect on textured stock paper turned out great!